We all have them in our lives. That friend at the dinner party who talks to your grandma about the mysteries of world matter and time. The kid who dresses like Marie Curie for Halloween. Your neighbour who uses their backyard as a science lab exploding watermelons, launching rockets and blowing giant bubbles. Most of which flies over the fence. Be thankful – this is the easiest person in your life to buy a gift for. They are delighted and curious about just about anything. Like how much does a teaspoon of neutron star material weigh and why is wombat poop square? All you need to do is flex your creative skills and think like a scientist. Sounds like a tall order? We’re here to help. The following gift ideas range from free to whatever you feel like spending. The sky is the limit (unless you’re an astronaut like David Saint-Jacques and we have no idea how he plans to send gifts this year from the International Space Station). For the person on your list who is constantly asking, “Why?” put together a gift basket with ingredients from these three fun and easy science experiments, complete with instruction guides and even a Honourary Scientist certificate. Kick it up a notch and buy a lab coat and safety glasses to go with it! The casual weather observer on your list will appreciate the sophistication and accuracy of today’s smart weather stations. They often integrate with smart home infrastructure, come with their own app and can tell you more than just the temperature, like wind speed and rainfall. Have a big budget and a climatologist on your list? Higher-end models (like those at our Climate Reference Stations) can measure things like UV index and soil moisture. Know someone who says they don’t want anything? Surprise them with this radon test kit that will detect whether there is radon gas present in their home. Radon is an odourless, invisible and tasteless gas, so you don’t know it’s present until you test for it. It’s also the second-leading cause of lung cancer in Canada. While you’re at it, test your home too. Do you have a do-it-yourselfer (DIYer) on your list? Developments in 3-D printer technology have created a new category of budget- and user-friendly models for home use. You can create spare parts, design 3-D sculptures or print a model of the solar system. Whether you choose a new book or an old bestseller, there is a treasure trove of books to give the reader on your list, from black holes to the science behind cooking. Need some hints? SRC’s CEO has curated a list of the top 5 books about technological innovation (and has also authored other books on a variety of topics). Every vehicle needs an emergency kit, but many drivers don’t have one. You can buy a kit, but you can also build one for the people on your list with some basic items: non-perishable food, water, warm clothing, a sleeping bag, a shovel, booster cables, tow rope, a traction aid (like kitty litter or sand), first-aid kit, a survival candle (commonly called a 30-hour candle) and matches. The point is to stay fed, watered and warm. 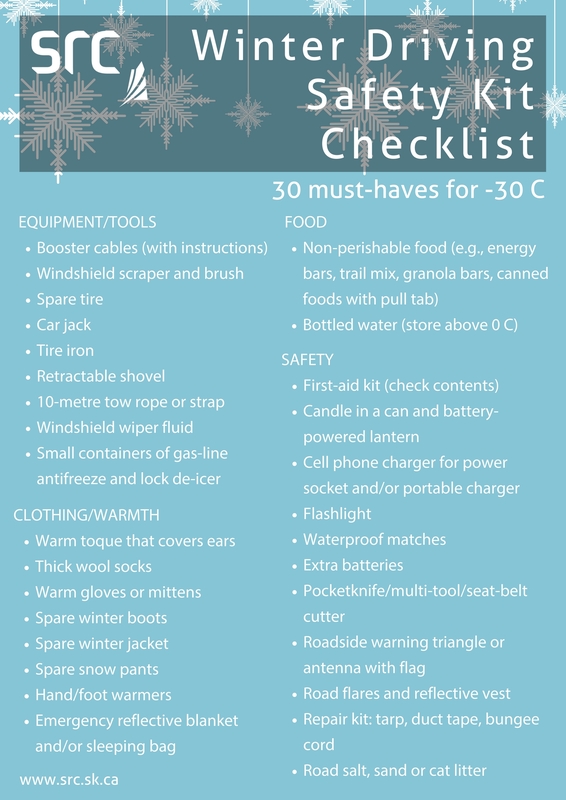 Check out our Winter Driving Safety Kit Checklist for more ideas. Is there an Aviation enthusiast on your list, a photographer or a kid who likes remote-controlled toys? Drones are yet another technology that have become more affordable and user friendly. Some considerations when buying one are safety (Transport Canada has safety rules), training (some require a operations certificate – like ours, but we do pretty advanced things with them), minimum age requirement, camera quality, flight time, size and controller type. “It’s great to be a geek,” says Jenna Smith-Windsor from SRC Environmental Analytical Laboratories. From socks to coffee cups, you can find a variety of things adorned with clever science puns and graphics that will get a reaction from anyone on your list. With all the big data hacks lately, everyone needs to be in the know about common internet security threats and how to prevent them. At SRC, safety is so important, both at work and at home, including online safety. Buy the person on your list an online course from a reputable course provider (some of them are free!) or give the gift of antivirus software. You can also turn your holiday cards into this handy internet security awareness guide to keep your loved ones safe from cyberattacks. We recently installed one of these workhorses in our petroleum research laboratory. It allows us to look at core samples from the oil and gas industry in very minute detail. A gift for the person on your list who has everything. A much more affordable gift would be a pair of novelty X-ray glasses, which are equally as cool (just not as useful in a real lab).